This child is due Wednesday. Everything I read tells me that I should be anxious to meet the little one. Everything I read tells me that I should be head over heels with excitement. Everything I read tells me that to be the perfect mom, I need to be so sure of my undying love and devotion to this little soul I've carried for 40 weeks. Everything I've read scares me because that's not how I feel. I'm terrified. Absolutely terrified. I have so many fears about becoming a parent. The whole process is overwhelming. One day, I'm a regular (nearly) 29 year old with a stable job, good friends, a nice house, and a man that I love. Then suddenly, I'm a MOM on maternity leave, with friends I might have to struggle to make time for, a house that is overrun with baby products, and a man who is as lost in the deep-end as I am. That's my fear. I know I'm not supposed to say it out loud, but what if I resent this kid? What if I wake up one day, longing for my pre-baby life, and decide that having a kid was a terrible mistake. Hell -- I still FEEL like a kid most days myself. How in the world am I even capable of raising one? I've always wanted to be a mom but it isn't the only thing I want to be. I want to still be a lawyer. A wife. An animal lover. A friend. A daughter. A sister. An activist. A free spirit. A political junkie. A brunch eater. A late night movie watcher. A nap taker. 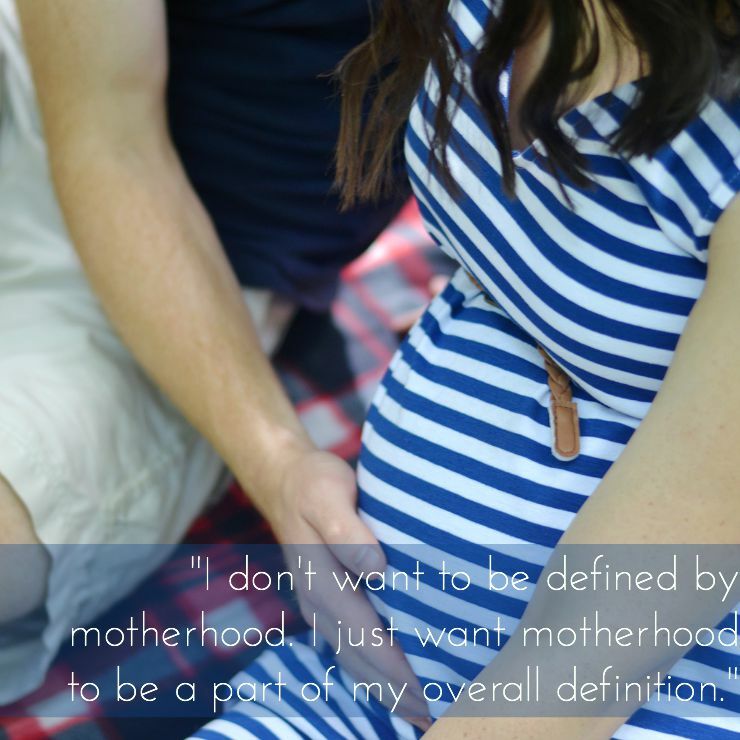 I don't want to be defined by motherhood. I just want motherhood to be a part of my overall definition. I feel like I'm watching the clock. I'm counting every "last"... the last time Adam and I eat out together without a child. The last time we go for a walk as a family of two. The last time we stay up late watching movies and talking about nonsense in bed. The last this... the last that. I really, really hope that soon I'll start counting firsts and that each of them will hold deep joy and satisfaction for me. The first time we all sleep through the night. The first time we all go on a walk together. The first time baby smiles or makes us all laugh uncontrollably. But I guess until then I'm just savoring all these lasts and trying not to get too overwhelmed by the thought that everything can change within hours.... and at any moment. I've read all the books. I've taken all the classes. I've listened to all the advice. Now I just hope and pray that I am cut out to be a parent... a mom... and maybe, at the end of the day, I'll somehow manage to be a pretty decent one. THANK YOU THANK YOU for your honesty. I'm not pregnant but feel these same emotions and have these thoughts. It's so scary thinking that your entire life will change afterwards. But I have heard from several friends that when you become a parent your universe just shifts. Shifts in a way that is completely natural and not something that you feel or have to consciously make happen. These are normal thoughts and its ok. This is how I felt right before I delivered and I still feel that way every once in a while. I will not kid you, that first month is horrible. You will be sleep deprived, lost and your husband will be even more lost. You will want to drive to work and bill some hours because at least you know how to do that. You will miss you old life, but you will adjust... eventually. You husband's scientist brain will overnanalyze and drive you nuts. Just hang in there. But do not be afraid to be scared, nervous, or even a little resentful of your old life every once in a while. Praying for you. I am not pregnant and not planning to be, for a while at least. We are freshly married and have plenty of nieces and nephews. We enjoy our current life. The feelings you write are exactly the feelings I believe I will have as well and it scares me to death to be a parent to a child. That is the primary reason we are choosing to be child-free. However, I am adaptable. I want to know if it's all worth it, as they all say. The sleepless nights, the messes, the frustration, the tantrums, all of it. Is it worth it? And how will I know? I will continue to be an avid reader of your blog and hope that you continue your honesty. I also completely agree with your choices on not disclosing a chosen name, spending time alone with your child, and not forming to gender stereotypes. You are a significant role model for me. thank you for that. Best of luck and prayers for a complication-free, healthy delivery and beyond! I wish I had, had the nerve to say it all when I was expecting. Believe me, everything you think will happen, will. You will be sitting up at night so tired you can't see straight while baby Florken is crying or feeding, or crying and refusing to sleep, or crying just because thats most of all they know to do. The thought will cross your mind, why. Why did we decide to change everything we knew, the perfect little world that was created before baby came along. BUT when baby snuggles into your arms up against you and you watch him/her sleep content, and innocent even if only for moments. IT WILL ALL BE WORTH IT. The love that you will fill you will be unexplainable. Your life may not go back to the way it was, but it will find normalcy again. A new normal, a better normal, a worth it normal. You all are in my prayers for a safe and speedy delivery and recovery. The final weeks of my pregnancy all I wanted was the baby to come out. I wasn't a joy during my pregnancy. I really didn't enjoy being pregnant at all. I didn't feel connected with the baby, I just wanted her out. I would get emotional and cry as Eric and I did things because I thought my life would never be the same. I thought I wouldn't feel connected to her and I will be honest, it took a couple of days to get all of the way connected. I was so tired and just going through the motions the first few days that I didn't get to know her. It comes though and when it does, it comes hard. You are so overwhelmed by love that it is actually terrifying. After a couple of weeks the baby just adapted to us. She adapts to our schedule and goes where we go. I tell Eric all the time I thought we would never be the same but we are. It just takes us longer to get places and we have to carry a lot more. You will get back to your normal routine and life a lot quicker than you think! Adam doesn't define you but enriches your life, so will this baby. There were many lasts before you met Adam and then love came along and then there were many firsts. Once that baby is born something just happens and it is like you don't remember life before them. Maybe a survival mechanism? :) There will be times where you will resent the baby. It does not make you a bad mother. It just makes you a mother. Going into this thing thinking everything is going to be sunshine and rainbows (too many people write it like that) is not going to do you any favors. Embrace the bad and it will make the good that much better. Yes to all of this! When I was pregnant with my first I totally felt this. I was down right scared to a hold a baby, i thought will I feel the same about my kid? I had no idea how to change a diaper, nothing. Just remember the first 3 months are the toughest, survival mode (just getting to the next day in one piece was an accomplishment) so don't be too hard on yourself. Good luck with labor! I think it's awesome that you feel comfortable expressing your thoughts even though they might not be the ones you're "supposed" to have. This baby will fit perfectly into your family and I know you will accomplish everything you want to in life! I think it's important to say the things you're "not supposed" to say. I should have. I struggled. I had (...have...?) PPD and felt so awful for so many reasons and still suffer torrential Mom Guilt. Good thoughts lady, these are very good thoughts. On a related/unrelated note: happy birthing! I'm thinking aboutcha! You are wonderful, your are amazing, and you are going to knock this out of the park! I love that you posted this. I am engaged to be married and me and my fiance have talked about having children and I am 32 and STILL can't completely see my life with a child. I have the same fears of resenting my child because I will lose sleep or miss events. I am still very indifferent. Maybe it will change when I get pregnant. Maybe it will change once I hold my child. But until then I am on the fence and scared as hell. Good luck to you! thank you for sharing this! i wrote a post last week about the real reason i'm not ready for a baby and it's because i deeply want it to continue to remain just my husband and me...for a while longer. i appreciate you sharing that you have fears of missing pre-baby life and i have those too (even without having a kid inside me). i'm glad you want 'mom' to become part of what defines you, not entirely who you are. well said! You GO for being honest! I bet you there are a LOT of women who feel or have felt the exact same way but have been scared to have frank conversations about it. There's nothing wrong with savoring every last just like there's nothing wrong with savoring all of the firsts that are going to happen.